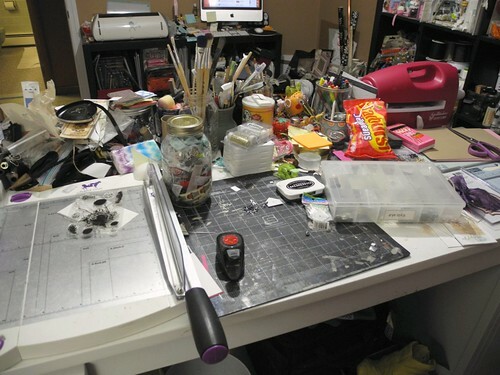 It's What's on Your Workspace Wednesday and I am quite pleased to report that I cleaned up my desk before diving into a couple of last minute Stamping Royalty submissions the other day. Then I messed it all up again. Then I picked it up again. Then I found out last night that I need to have two cards made, supplies listed, and the whole shebang in the mail very quickly, and took out a bunch of stuff again. The following photo is somewhere in the middle of all that. Just say'n. By 'in the middle' I really mean 'toward the end' of all that. I did actually START the card last night after taking this photo due to a sudden 30 minute (or so) opportunity to craft. Take 'em when you get 'em, right? Right. K. Thanks. Bye. NOOOOO!!! Not bye, sillies! I have a project to share with you, too, of course!!! As I've mentioned, Retro Cafe Art is sponsoring Gingersnap Creations this month and this week's challenge is pretty fab! You can create ANYTHING inspired by the last century! I decided to go with LATE last century. As in the 1980's-ish. You know, back when TV's were small and consoles and, well, kind of cooler than they are now with their big fancy flatness and such. I KNOW, RIGHT???!!!! Yup. You can totally get that little tv shrine at Retro Cafe Art. I'll wait. Oh...before you go, you may need to stock up on Stickles, too, because I created the entire test pattern out of fabulous glitter glue. K. Now you can go check it all out. I'll wait. For reals, this time. Just say'n. Oh! One more thing! 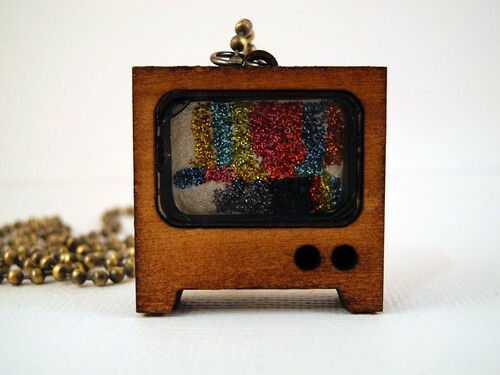 Okay...well, two more, actually....you are also going to want the fabulous Tim Holtz beaded chain and jump rings to make your awesome tv into a necklace. K? K. Just say'n. Other than that, you are pretty much set! I'm going to assume you already have distress ink to color it because you are a cool kid like that. Soooo....what have YOU been up to? Make anything cool lately? Well, now is the time, my friends! Check out what the Gingers have created inspired by the last century and then create something FABULOUS!!! K. I'm going to keep eating my jelly beans now. Jelly beans make me happy. And mildly hyper. OH! Nope! It's actually the amazing 80+ degree weather that's making me both happy and hyper!!! LOVING IT!!!!! K. Back to the beans. See you folks later! Great fun post today (mind, they normally are!) Don't eat all the jelly beans at once... lol! Jingle, your necklace is FAB-U-LOUS!!! No seriously, it's AWESOME!! And jelly beans rock! My supply is very low. Only about 1/4 cup left. I need to get to the store asap. so glad you found the jellybeans!!! i bought a bag but my boys found it and ate all of them!!! bad boys breaking into mom's secret stash--lol!!! 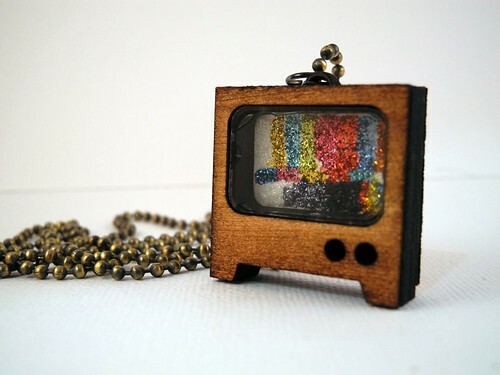 Oh what a cool little tv necklace! Love the style but I'd say it's even more retro than the 80's, maybe the 60's! (I know cause I was alive in those days!) lol-grazing on jellybeans...makes me sleepy:) but it doesn't stop me from eating them! Hey! Where'd you get my old tv? Shoot, I was born in 1950. Shoulda seen THOSE big old clunky things! That necklace is EXTRA cool & I need to get over to Retro Art and BUY stuff! Uhhhh ... pass the jellybeans, please. I'll take a licorice if YOU don't like 'em! Thanks for the update on the jelly beans, mine is chocolate dove eggs, I have had to share lately! What is the t.v. made of? It looks like wood. I love your necklace! Glad you have a supply of jelly beans! They are a very important food group!!! Love this... all that stickles is awesome... hehe you crack me up... All the jelly beans in this house are gone except for the grape ones so it looks like rabbit turds in the jar.. lol Don't eat em all in one day..
YOU did an awesome job but then you always do my quirky artistic chickie. Enjoy those jelly beans but in moderation babe...moderation!!! I LOVE Retro Cafe Art! I ordered 10 or their stencils the other day and so far they have been my favorite tool to play with- I wish they made plastic stencils so they lasted longer but whatever- I use the ones I have and order more. LOVE what you did with the mini tv! That is AWESOME! The glitter test pattern is classic- very clever- I would definitely wear it. I am in love with this retro tv! Although, I have to say that the comment about the 80s and last century made me feel really old! LOL! Ermm... not really sure how to break this to you, but maybe you should cut back on the jelly beans just a wee bit. I mean a smidgen ya know? LOVE the TV pendant. OMG! I just don't know what else to say about that because its coolness leaves me speechless. Only I'm not speaking anyway... its coolness leaves my typing fingers stunned into non-movement. That tv is ADORABLE. So, if you're finished with it, I'll send you my address . . .
OMG I love this mini tele, so cool. LOVE your desk and your fun TV! I bought this little TV--what a clever idea to make a test pattern!